Clint Bowyer picked up the 7th last-place finish of his Monster Energy NASCAR Cup Series career in Sunday’s Bojangles’ Southern 500 at the Darlington Raceway when his #14 Carolina Ford Dealers Ford fell out with engine trouble after 18 of 367 laps. The finish, which came in Bowyer’s 422nd start, was his first of the season and his first in a Cup Series race since last August at Michigan, 37 races ago. Following a terrible one-off season for HScott Motorsports as he awaited the retirement of Tony Stewart, Bowyer was more than ready to take over the #14 ride this season at Stewart-Haas Racing. 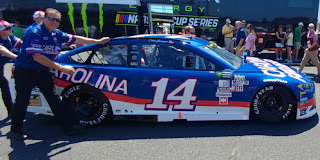 After a 32nd-place finish in the Daytona 500, Bowyer finished inside the Top 15 for the next eleven consecutive races, including a 3rd at Fontana and a runner-up to Jimmie Johnson at Bristol. 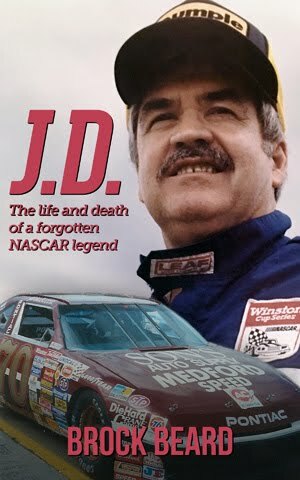 This past summer, he finished 2nd two more times, wheeling a battered Ford at Sonoma behind Kevin Harvick, then Ricky Stenhouse, Jr. at Daytona. But his first win of the season – his first, in fact, since 2012 – continued to elude him. 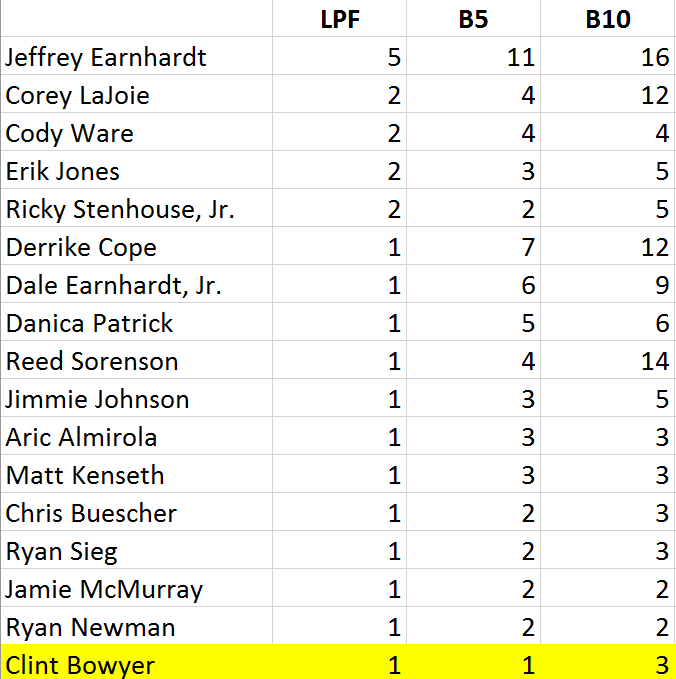 Another consequence of Bowyer’s consistent, but winless season has been his rank in the standings. 10th overall headed into Darlington, Bowyer was still ranked fifth among winless drivers in the Chase Grid. Unfortunately for him, while Matt Kenseth, Jamie McMurray, and Chase Elliott held the three current winless positions, Bowyer was not only outside the cut, but ranked behind Joey Logano, whose encumbered win at Richmond also put him in a “must win” situation. After running tributes to both Buddy Baker and Benny Parsons the last two years, Bowyer this season elected to honor 1993 and 2009 Southern 500 winner Mark Martin, one of two in the field. While Trevor Bayne ran a throwback to Martin’s Stroh’s Light Ford on his #6 AdvoCare machine, Bowyer drove the Carolina Ford Dealers paint scheme that Martin ran for Bill Davis in what is today the XFINITY Series. Building on the “throwback” theme of the weekend, Martin, who joined Bowyer at the track for media availability, is preparing a special race on September 26-30 at the Batesville Motor Speedway. The Batesville track, site of Martin’s first-ever race in 1974, will host the “Race 4 Hope ’74,” which will benefit Mark and Arlene Martin’s youth initiative Hope for Arkansas, Inc. More details on the event can be found here. Bowyer’s turn in the Martin scheme began with a 14th-fastest lap in Friday’s first session, a 17th in Happy Hour, and 16th on the grid with a lap of 175.291mph. Starting last was Carl Long, who was set to make his first Cup start since Kansas and his first Southern 500 since 2005. On a weekend where splitter issues cut short his race in the XFINITY Series race, Long’s #66 CrashClaimsR.us Chevrolet turned in the slowest speed in two of the weekend’s three sessions, the exception a 38th in opening practice that put him ahead of Derrike Cope and Cody Ware. He arrived on the grid in a different uniform from earlier in the weekend, swapping out the 2006 RoadLoans.com outfit from Saturday’s race for the Millstar Tools suit from his unsuccessful 2008 Daytona 500 bid. When the green flag dropped, Long remained in last heading into and was behind by open track heading into Turn 1. By Lap 2, his #66 had caught up to 39th-place starter Cody Ware, whose #51 was running the Mello Yello paint scheme from “Days of Thunder” in an effort to support relief for victims of Hurricane Harvey. Long worked over Ware through the backstretch, then cut low in Turns 3 and 4, clearing him down the front. Later in the race, Long would climb out of his car and hand over driving duties to his XFINITY teammate and Brickyard 400 14th-place finisher Timmy Hill. Despite heavy right-side damage, the #66 managed a 33rd-place finish, the third-lowest finisher to end the race under power. Next to join the last-place battle was Ryan Blaney, whose #21 Motorcraft Throwback Ford (honoring Kyle Petty’s 1987 scheme) caught the wall early and cut down a tire, forcing an unscheduled green-flag stop. 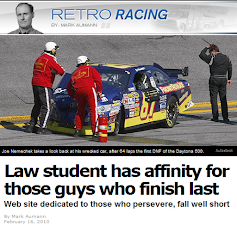 He was also the first of several drivers to miss the entrance to pit road, forcing him to come around again. 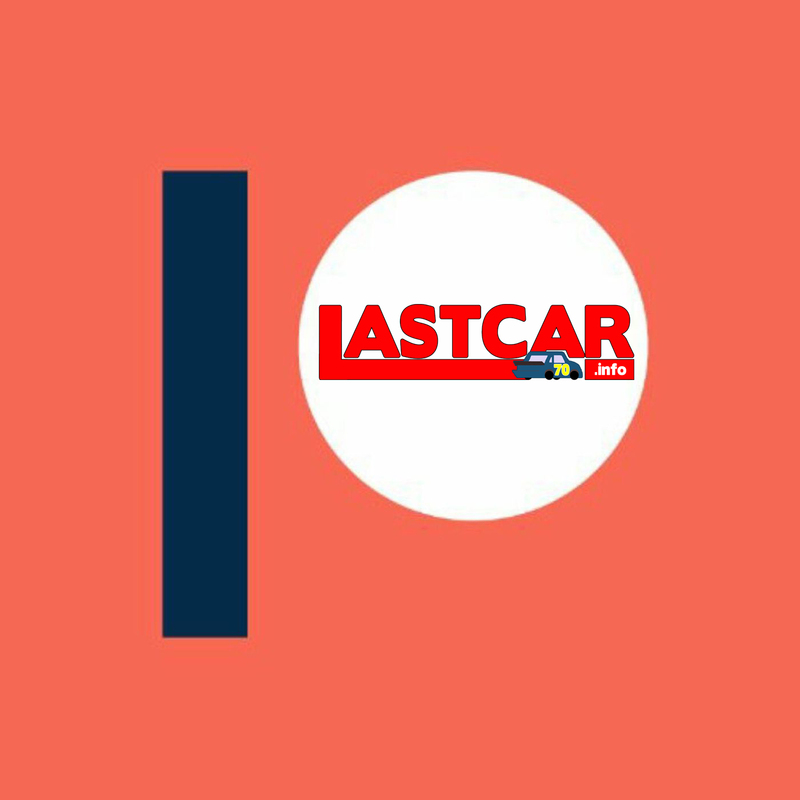 It was Blaney who was the first driver to lose a lap, and he’d lose a second one before he returned to the track. Now with much fresher tires than the rest of the field, he proceeded to fly past several other cars, catching the attention of MRN’s radio broadcast. On Lap 14, Trevor Bayne broke loose between Turns 3 and 4, smacking the wall with the right-rear of his #6 AdvoCare Throwback Ford resembling Mark Martin’s 1988-1989 Stroh’s Light Ford. Bayne limped around the track for two laps, ultimately drawing the caution when he dropped debris and trailed smoke down the backstretch. Bayne made it to pit road under caution and began losing laps as the “Crash Clock” ticked down. It wasn’t long before he took 40th from Blaney. Under this yellow, following the first round of caution-flag pit stops, Clint Bowyer was sitting in front of the empty Stall 43, just a short distance past the entrance to pit road. Bowyer had reported an overheating issue, then smoke in the cockpit, and both driver and crew were trying to get a tow truck to push the car back to the pit stall. For whatever reason, this help didn’t arrive promptly, and the #14 sat in the same spot for nearly three full laps. Carl Long had to drive his car around Bowyer to make his stop. “Why are they not coming to get us?” was asked over the radio. 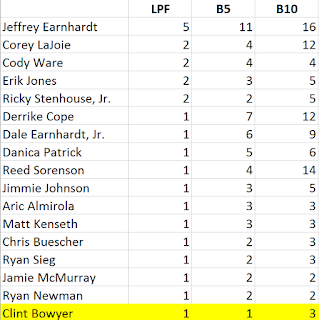 By the time the truck came, Bowyer had fallen to 39th, behind Blaney but ahead of Bayne. The crew decided to have the truck push the car back to the garage by way of the second and furthest entrance from Stall 43. Around this point, Bowyer had dropped behind Bayne for last as the #6 managed to beat the “Crash Clock.” Bayne managed to claw his way to 35th at the finish, the final car under power. But by Lap 72, Bowyer was listed out of the race. 39th on Sunday went to Reed Sorenson, whose #15 Xchange of America Throwback Toyota to Morgan Shepherd’s 1990 Motorcraft Ford lost the clutch after 104 laps. Curiously, this also required a push into the garage, which he received promptly on Lap 106. 38th fell to Daniel Suarez, who smacked the Turn 1 wall in his #19 Arris Toyota on Lap 125. In 37th was last-place starter Cody Ware, who on Lap 157 tangled with A.J. Allmendinger in Turn 1, then collided with the approaching Matt DiBenedetto. Rounding out the Bottom Five was Gray Gaulding, who shredded a right-rear tire and much of the bodywork when he spun on Lap 197, then pulled behind the wall after struggling to maintain minimum speed. The same pit issues that same to define the night also plagued Gaulding, who stopped at the first garage entrance, turned, then pulled into the second. Matters were made worse for Gaulding after a water pipe above his garage stall ruptured, showering his battered #83. 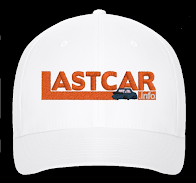 Now, for both Bowyer and Joey Logano, each driver is still in a “must win” situation next Saturday at Richmond, the final round to make the Chase. 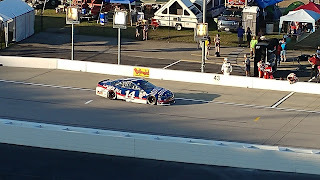 *This marked the first last-place finish for car #14 in a Cup Series race at Darlington since September 7, 1959, when Carl Burris’ 1957 Ford lost the engine after 2 laps of the Southern 500.